Absolutely loved this. Everything about the story was fascinating. 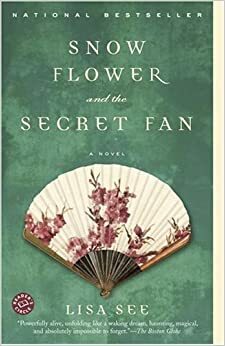 Set in early 19th century rural China where women are less than worthless and their only hope of success are beautiful "golden lily" feet (bound and broken) and to give birth to sons. But despite what we "Westerners" of the 21st century would consider a bleak and horrid situation, this book isn't a complaint or condemnation of the culture. Instead, it's a beautiful, thoughtful, deep and touching portrait of women, two in particular: their friendship and devotion, their sense of propriety and individualism, their growth and joys and betrayals, fears and hopes mingled in with fascinating historical and cultural detail. It's beautiful. Much of the plot centers around nu shu, a sort of secret-code writing developed and used exclusively by women in the Hunan province of China - to give them a voice, a way to express and give meaning to the sorrows and joys, victories and defeats of their lives. The writing is fantastic and engrossing - I could hardly put it down and couldn't stop thinking about it. And its themes of friendship and truth and loyalty transcend its setting. I can't recommend it highly enough - all it needs is a good follow-up discussion to really pull out its message and value in contemporary women's lives.